The Jewish National Fund of Canada, one of the country's long-established charities, has faced an audit by Canada Revenue Agency over a complaint it used charitable donations to build infrastructure for the Israel Defence Force in violation of Canada's rules. JNF Canada says it has since stopped the practice. That would not protect it from action by the Canada Revenue Agency (CRA), which in August revoked the charitable status of an Ottawa mosque for promoting "hate and intolerance" by inviting controversial speakers, and for financial irregularities that took place between 2009 and 2014 under a previous group of directors. In its guide for Canadian registered charities carrying out activities outside Canada, the CRA states plainly that "increasing the effectiveness and efficiency of Canada's armed forces is charitable, but supporting the armed forces of another country is not." Yet JNF documents describe some of the charity's spending in Israel in those very terms. One JNF Canada document called "Project Opportunities" refers to an "outdoor fitness area at a Gadna military base," describing Israel's Gadna program as "a special program for young people in Israel that prepares them for their service in the Israel Defence Forces." The project included "a fitness area for the regular army staff at the Gadna base in Sde Boker." Documents produced by JNF Canada's Israeli parent organization, Keren Kayemeth LeIsrael (KKL-JNF), shed additional light on military projects funded by its Canadian affiliate. They include developing "the new planned IDF Training Base City in the Negev" desert, "helping the development of the Bat Galim training base complex area" at Bat Galim Naval Base, "helping to facilitate the upgrade of the existing auditorium for soldier intake, training and conferences" at the same base and a new "moadon" or mess hall-type facility for the 124th (Blackhawk) Helicopter Squadron at Palmachim Air Force Base ("where crew can relax and refuel"), as well as a similar facility for 131 Squadron at Nevatim Air Force Base. The logic behind the CRA's guidance to charities is that issuing Canadian tax receipts for contributions to foreign militaries effectively reduces the revenue available to support Canada's own defence spending. In 2014, JNF Edmonton's Negev Gala dinner was serenaded by members of the Royal Canadian Artillery Band. According to JNF Edmonton's Facebook page, "proceeds from (2014's) Negev Gala will develop three areas of the Negev's Tse'elim army base, the largest military training facility in Israel. The project will upgrade and landscape the family visiting area, intake and release facility and the barracks' main plaza. The base is the national centre for ground forces training." JNF Canada declined an interview request for this story, but CEO Lance Davis told CBC News in an email that while the organization has funded projects that support the IDF in the past, it stopped doing so in 2016 after being informed of the CRA guidance. "To be clear, we no longer fund projects located on IDF land and JNF Canada operates in accordance with CRA regulations governing its status as a charitable organization," Davis wrote in the email. Megan McKenzie says she first came across the Jewish National Fund when she was planning a bequest in memory of her nature-loving Jewish grandmother. The Jewish National Fund is famous for planting trees, "greening the land of Israel." McKenzie is a professional mediator and conflict consultant who is married to a Canadian soldier and lives at CFB Shilo in Manitoba. Having worked in conflict resolution from Ireland to DR Congo, she said was "dumbfounded" to find that the JNF was involved in projects she believed did not conform to Canada's charitable rules. "I have a PhD and I'm sort of a natural researcher and so I did some online research," she said. "And the more I did, the more appalled I was." 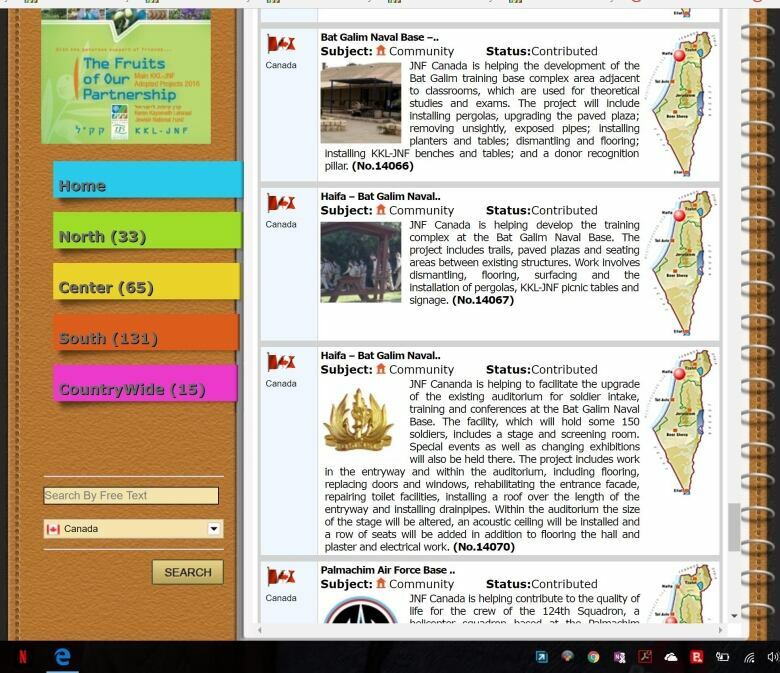 McKenzie's online research led her to webpages for both JNF Canada and its parent organization giving extensive details on the charity's support for the Israeli military and its reforestation projects that have sprawled across the 1949 armistice line (the "Green Line") into occupied West Bank territory. In the case of the JNF's Canada Park project, occupied land forested by the JNF was enclosed on the Israeli side of the barrier Israel built to separate its citizens from the Palestinian population in the West Bank. Canada Park was JNF Canada's first large project in Israel and the West Bank, built on the site of three Palestinian villages left empty after 1967's Six Day War. Retired physician Ismail Zayid of Halifax was born in one of those villages, Beit Nuba. 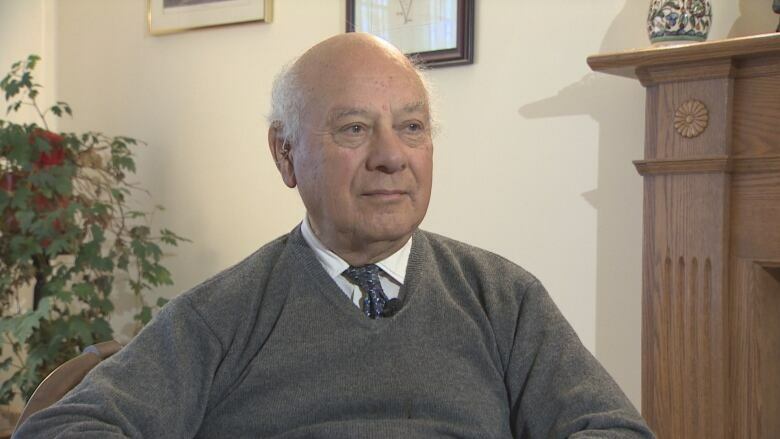 He has been complaining to CRA about JNF's charitable status for 40 years. "I wrote to (the CRA) repeatedly," he said. "They would say they are conducting an investigation of (the) complaint, and then I would write again and say, 'What are the findings of your investigation?' And they would say, 'The findings are confidential.'" In October 2017, Zayid filed a new formal complaint, this time in concert with an Ottawa professor, a Vancouver rabbi and a retired nurse from Montreal and using some of McKenzie's research (the complaint has been backed by the activist organization Independent Jewish Voices Canada, which has mounted a "Stop the JNF Canada" campaign). The CRA appears so far to have taken no action against the charity, although it has subjected JNF to an audit. The CRA declined to be interviewed for this story, citing confidentiality. But JNF Canada's Davis said in an email to CBC News the charity is "currently engaged in ongoing confidential discussions with CRA." Davis dismissed the complaint as "a rehash" and called IJVC "a longstanding opponent of JNF." The 2017 complaint includes new information about JNF's contributions to Israeli military infrastructure projects and its involvement in building in the West Bank. Canada officially opposes Israeli settlement-building in occupied territory. CRA policy statement CSP-P13 states: "The courts have held that an organization is not charitable in law if its activities are contrary to public policy." Canada states its position on settlements on Global Affairs Canada's website: "Israeli settlements in the occupied territories are a violation of the Fourth Geneva Convention. The settlements also constitute a serious obstacle to achieving a comprehensive, just and lasting peace." JNF Canada missions in Israel also have contributed directly to the construction of at least one hilltop settler outpost that was declared illegal by the State of Israel itself. Givat Oz VeGaon received and ignored at least 18 demolition orders from the Israeli Ministry of Defense. A JNF Canadian Young Leadership Solidarity Mission visited the site in August-September 2014 and worked with picks and shovels "to prepare the ground for building a residential unit to be used by the security guard." 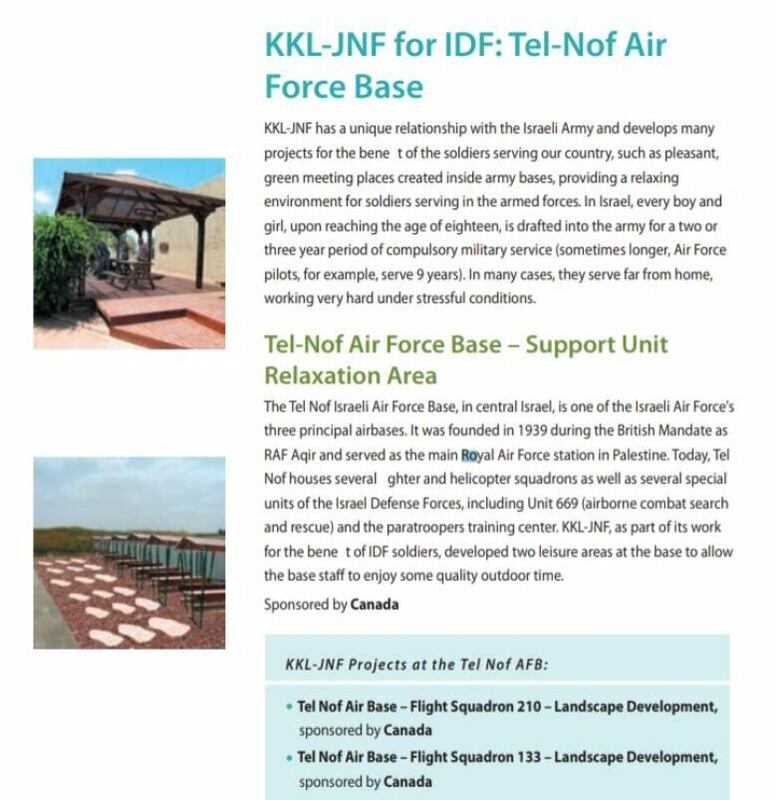 In a 2014 document produced by the JNF Canada's parent organization, the Israeli JNF's Resources and Development Division lists a dozen "KKL for IDF" projects over the previous decade as "Canada-sponsored," mostly in the period 2011-14. One JNF Canada document from 2014 offers donors the chance to participate in the construction of a "meeting point" to enable soldiers to see family members while on active service. Canadian donors are also invited to fund a 900-metre "security road" at Kadesh Barne'a near the Egyptian border that "will improve access to the area for security forces." A KKL-JNF document describes its roads in the western Negev as "security roads which serve the armed forces that patrol the border zones … All the work undertaken by KKL-JNF is coordinated with the IDF … Thanks to these roads, military activity is enhanced." In an email to CBC News, Davis said these projects were just part of the works funded by JNF Canada. 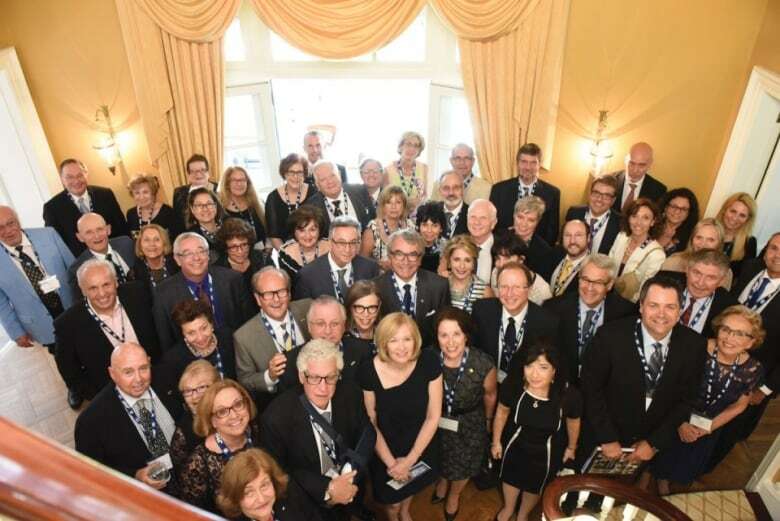 "Thanks to the generosity of Canadians, JNF Canada has played an important role in a wide range of projects in Israel. We have, for example, supported the building of water reservoirs, collaborated with dozens of educational institutions, built numerous recreational/educational facilities, planted millions of trees and supported pioneering research in green technology," he said. "In keeping with our mission of improving the quality of lives of Israelis, we have in the past funded projects of a charitable nature that indirectly involved the IDF. These projects were built on land owned by the IDF primarily for the benefit of children and youth. When it came to our attention several years ago that supporting these types of projects may not be in keeping with CRA policies, we stopped funding them." In a subsequent email, Davis said that "the last project we funded was in June 2016 and it was directed to the Hatzerim Airforce Base for a playground/soccer field for the children living on the base." 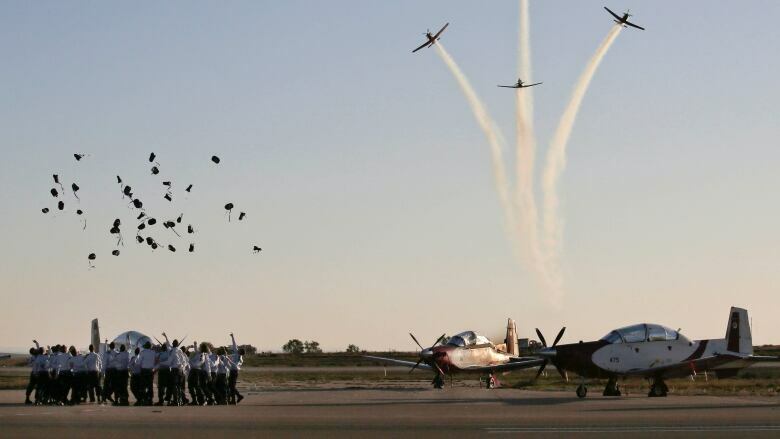 Hatzerim is home to the Israeli Air Force's flight academy and three combat squadrons. Kate Bahen heads Charity Intelligence, a Toronto-based NGO that produces a report rating Canadian charities on their transparency and efficiency in spending donors' money. 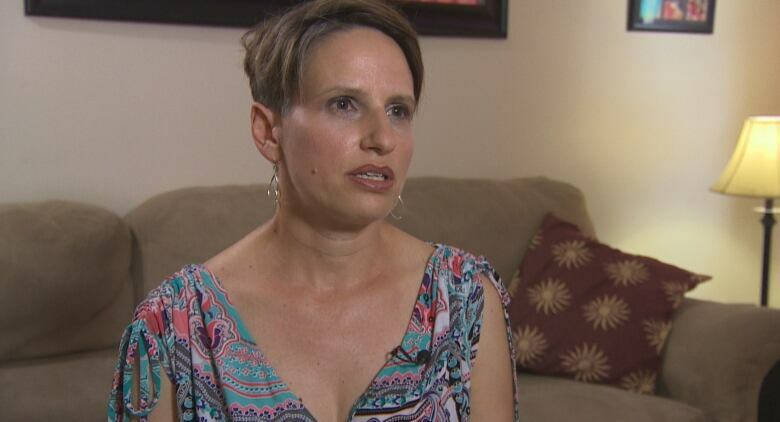 "When you look at JNF Canada, it's fine for cost efficiency," said Bahen. 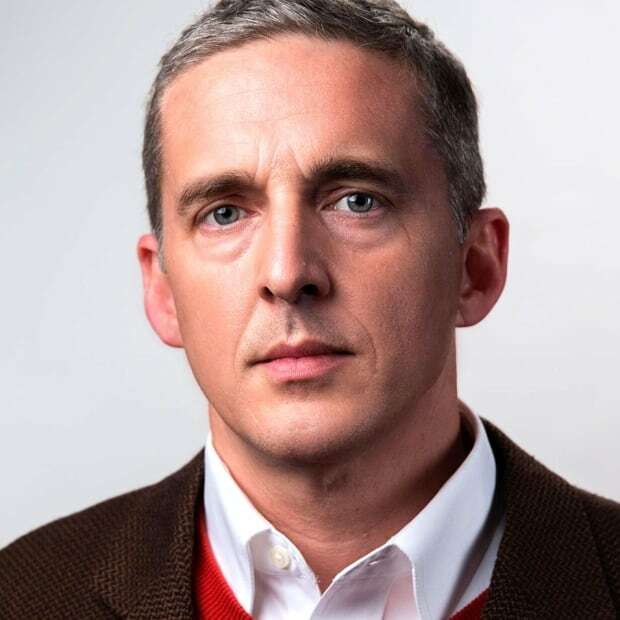 "It really falls down on financial transparency and accountability. For financial transparency, it gets zero." Bahen said the charity has done the right thing by disclosing to donors that it's being audited, but it is "an utter black box" when it comes to providing a breakdown of how its money is spent. "Any Canadian donor who knows of JNF automatically thinks of planting trees. And there is a lot more to JNF than planting trees. "We have absolutely no information on how much it's spent planting trees, how much goes for irrigation, or education, or how much is diverted to military bases. And that information, I think, is critical, and it's not provided to Canadian donors." JNF has had strong relations with successive Conservative and Liberal governments. One of its recent projects in Israel is the Stephen J. Harper Hula Valley Bird Sanctuary in Galilee. Another is John Baird Park in Sderot. Although the group enjoyed particularly strong links with the Harper government, it also has been close to the Trudeau government. 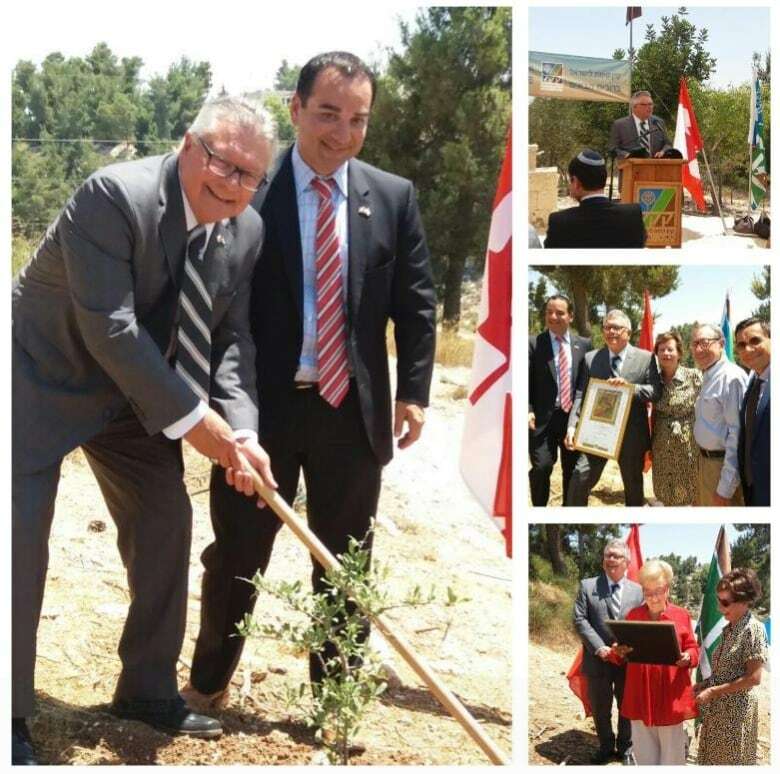 Last July, Ralph Goodale, Canada's minister of Public Safety, planted a pistachio tree at the JNF's VIP Tree Planting Center in Jerusalem. 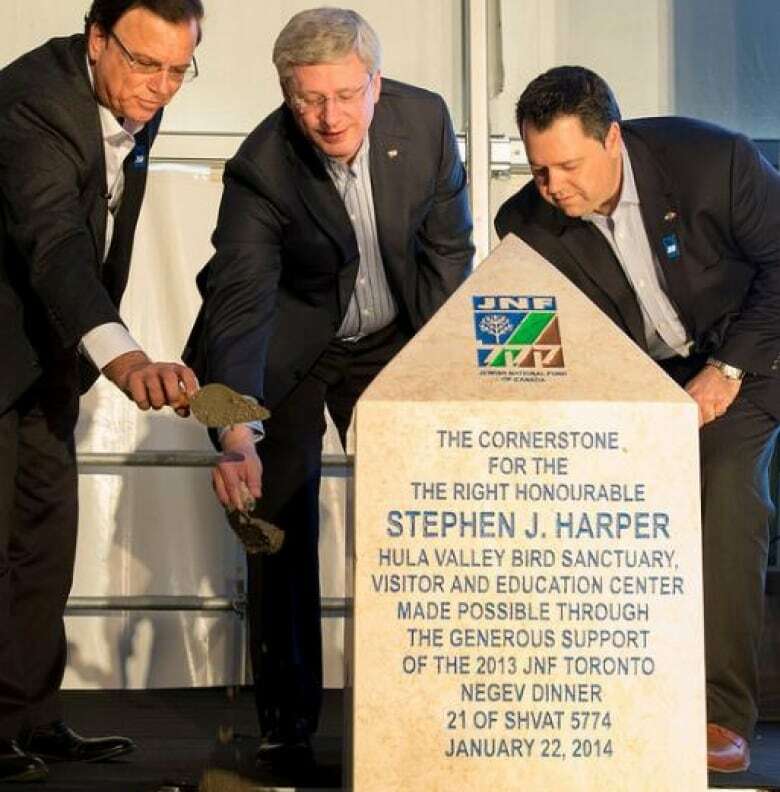 He was accompanied by fellow Liberal MP Michael Levitt, a former board member of JNF Canada.